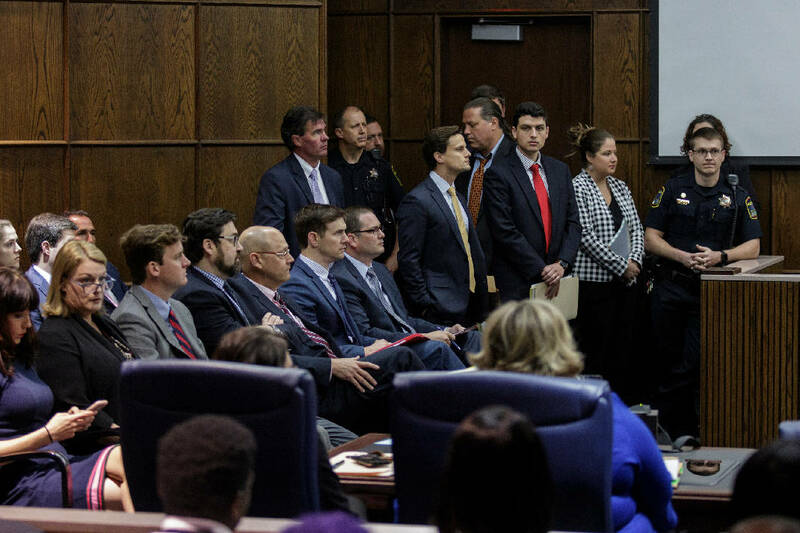 Attorneys fill the courtroom before the arraignment of alleged gang members in Judge Tom Greenholtz's courtroom in the Chattanooga-Hamilton County Courts Building on Friday, April 27, 2018, in Chattanooga, Tenn. 45 of the alleged Athens Park Blood gang members indicted last month on RICO charges were arraigned Friday. Concerns of retaliation are swirling among those involved in the state's 55-person gang racketeering case after FBI files describing parts of a four-year-old investigation surfaced on social media this week. A number of fearful defendants and witnesses contacted the Hamilton County District Attorney General's Office after a charged person in the ongoing case against the Athens Park Bloods street gang posted documents on Facebook that showed their names, prosecutors wrote in a brief Tuesday. Since that time, Criminal Court Judge Tom Greenholtz has ordered everyone to stop posting anything electronically, although attorneys and defendants can still make paper copies and discuss the documents. A hearing will take place Oct. 29. Prosecutors declined to comment Friday. But posting court documents on social media is still new territory in the realm of criminal justice. In August 2017, a mother who lost a child in the Talley Road school bus crash that killed six children posted documents on Facebook that resulted in civil attorneys on both sides agreeing to seal off certain information in the case. But the stakes are different in a 55-person case in which three people face death penalty sentences for allegedly killing a state's witness in 2016 — and in which cooperating with law enforcement is considered a sin by the street gang. Ray Surette, a professor at the University of Central Florida who specializes in media, surveillance and criminal justice, said posted evidence can harm the logic of a fair trial for the defense and the prosecution. "If you think of a trial as an information filter, it's supposed to be a sealed container, and you dump in potential evidence at the top, and it goes through the culling process of the rules of evidence, and things are vetted by the judge, and that's what's supposed to reach the jury," Surette said. "Social media is the equivalent of going around that container. That's the real danger: It destroys the ability of the government to pursue cases ... and for the defendant to have a trial start with the presumption of innocence." Without saying how or precisely when, prosecutors said defendant Broderick Lay posted various documents from an FBI file on Facebook. Broderick did so after prosecutors shared the evidence with his defense attorney, District Attorney General Neal Pinkston wrote in his brief. In every criminal case, prosecutors must provide the evidence they plan to use against a person with that person's attorney. That process is called discovery, and court files show that prosecutors began doing that around Sept. 5. The Times Free Press couldn't locate Lay's Facebook account, but a different account shows where someone posted 10 screenshots on Monday at 10:33 a.m. Those shots appeared to outline two conversations the FBI had about unsolved murders with people involved in the case, a report from a confidential informant about an alleged gang member getting addicted to pills, a 2014 discussion in which somebody provided information on the 2014 murder of Deontrey Southers, a breakdown of witness information in the 2016 Horton murder, and a hierarchy of the gang's supposed leadership. Although the Times Free Press verified the identity of the person, it will not be naming them or others because of widespread concern of retaliation against them. Nearly 150 people shared the post, and another 50 commented on it. The responses ranged from sadness and outrage over the victims to frustration over snitching. As of Friday afternoon, it remained up on Facebook. The documents indicate that FBI agents have used interviews and confidential informants to help build a file against the Athens Park Bloods since 2014, when 13-year-old Deontrey Southers, an East Lake Academy of Fine Arts student, was shot through a door and killed. Authorities say Southers wasn't the target; a rival gang member was. According to the gang racketeering indictment, Cortez Sims faces murder charges for Southers' slaying. Earlier this year, Pinkston secured charges against 55 people for allegedly conspiring to further the criminal activity of the Athens Park Bloods. Those charges include three death penalty notices against Andre Grier, Courtney High and Charles Shelton for charges they kidnapped state witness Bianca Horton in a white van and shot her to death. Authorities say the primary motivation for Horton's death is she planned to testify against another gang member who was charged at the time with attempting to murder Horton and her baby in 2015. Outside of those charges, many defense attorneys have demanded strict proof that their clients belong to the Athens Park Bloods. They're also challenging whether the state can prove that each defendant's prior criminal charges are connected to the gang.